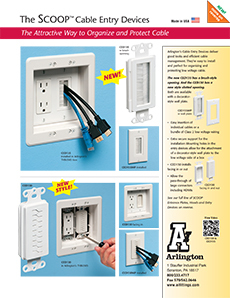 Arlington’s Cable Entry Devices deliver good looks and efficient cable management. 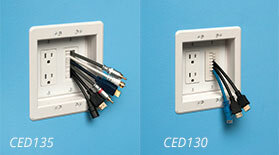 They’re easy to install and perfect for organizing and protecting low voltage cables. The new CED135 has a brush-style opening. And the CED130 has a new style slotted opening. 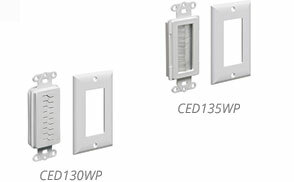 Both are available with a decorator-style wall plate. Each of our SCOOPs mounts directly to the wall with drywall screws. 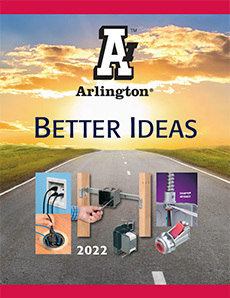 For added support, mount one of Arlington’s low voltage mounting brackets; LV1 to LV4 (See bottom of page). See our full line of SCOOP Entrance Plates, Hoods, and Entry Devices below. low voltage side of a box. • Allows the pass-through of the large connectors including HDMIs. 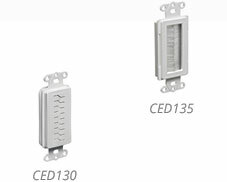 Reversible non-metallic cable entrance plates for existing cables. Protect cables and provides installation versatility. Non-rusting, white paintable plastic. Designed to install Low Voltage Class 2 Only. Reversible, non-metallic cable entrance hoods for existing cable. White cable entrance hood for use with decorator style wall plates. Protects cable and provides installation versatility. Designed to install Low Voltage Class 2 Only. Hoods can be used facing in or out!